On Monday, the axis of the monsoon axis passed through Amritsar, Chandigarh, Nanital, Gorakhpur, Asansol and Kolkata and thence southeastwards to eastcentral Bay of Bengal. Now, the western end of the monsoon axis has shifted north of the normal, indicating a dull phase for the regions south of the axis. And the westerly winds are blowing straight into the plains of north India (IMD streamline map). 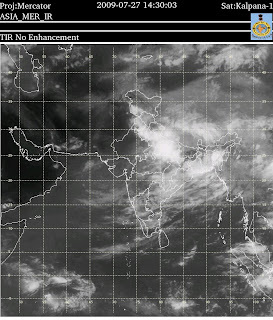 It is not a particularly strong monsoon in the central/southern and western regions, including the north-west,now. Nor is it weak along the axis, as is evident from the heavy rains along the Himalayan foothills, Bengal and the north-east, w hich have been in deficit and need the rains. Last week’s forecasts had indicated the formation of a weak ‘low’ in the Bay by the 26th./27th. It is now awaited, and hopefully soon that too. A fresh spell of rains along the central and north-western regions is required soon, but, the path of the forecasted low cannot be projected yet. What I am fearing is the arrival of a ridge in the 500 hpa region from the west. If it moves along the path of north-west India eastwards, then we may have to bear up with a dry spell. This can be thwarted only by a low from the bay, which can literally halt the advance of the "dry" ridge. And that is what we in the sub continent must hope for ! . For the next 2 of days,for India,the precipitation scene might just remain the same as on Monday. Mumbai will have a couple of heavy passing showers on Tuesday morning and afternoon. With more sunny intervals after lunch time. Rain will be about 15 mms. But the rains will on Wednessday, when i expect less than 10 mms . 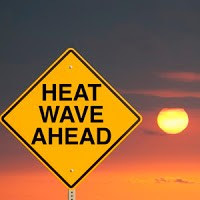 A bit hotter on Wed. 31 c again like on Saturday.